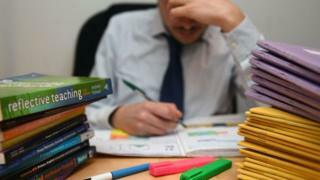 Image caption The union said said the pressure on school leaders had become "intolerable"
A union representing many school leaders in Northern Ireland has received an "unprecedented" mandate for industrial action. The National Association of Head Teachers (NAHT) represents principals and vice-principals in about two thirds of NI's 1,100 schools. In the union's indicative ballot, school leaders voted overwhelmingly to proceed to a formal vote on action. In total 93% of its members voted for industrial action short of striking. Action up to and including strike action was backed by 58% of members. The NAHT now has a mandate to proceed to a formal ballot on whether to take either strike action - or action short of that - if they decide to do so. NAHT NI president Geri Cameron said the move was unprecedented. "Head teachers are a very moderate group of people, but we are stretched to the limit," she said. "We haven't escalated our dispute over pay. Our issues are around special educational needs, workload, the general slice of the cake schools get. "There are a range of very complex issues that need to have tangible outcomes seen by our members for them to walk away from this. "This indicative ballot has been overwhelming in its return." Ms Cameron said she "doesn't remember similar action" in 34 years in education. "This is not the type of thing headteachers do, but there it is - the marker is down." The NAHT is the only one of the five main teaching unions in Northern Ireland not currently engaged in a form of industrial action. The move was announced during a Stormont meeting hosted by the NAHT and attended by about 100 principals. Politicians from Alliance, UUP, Sinn Féin, SDLP and DUP were asked a series of questions by school leaders, mainly around school funding and budgets. Education has received 1.1% more in cash terms in the 2019/20 budget than the end of the previous year. However, that is a small fall in real terms when adjusted for inflation. At the meeting, principals also said that in many cases it was taking considerably longer than the recommended 26 weeks to get a statement for children with special educational needs. Many also expressed frustration that there was no executive to make crucial decisions about education. NAHT members had previously decided not to progress to industrial action in an indicative ballot in February 2017. However, the majority of members have now changed their minds.